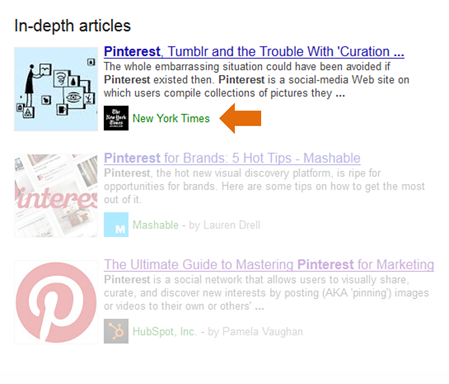 Just a couple weeks ago, Google released a new feature -- "in-depth" articles. The idea was to bring quality content to surface. According to research,10% of people's daily search needs are for more in-depth content. So this new feature is intended to help unearth more of that in-depth content. But it also goes beyond that. "[Google's] often said that the perfect search engine will provide you with exactly what you need to know at exactly the right moment, potentially without you having to ask for it," says Jon Wiley. Clearly, Google is trying to make their search results more contextual (though that will be a work in progress, and whether "in-depth articles" actually address that need is yet to be seen). 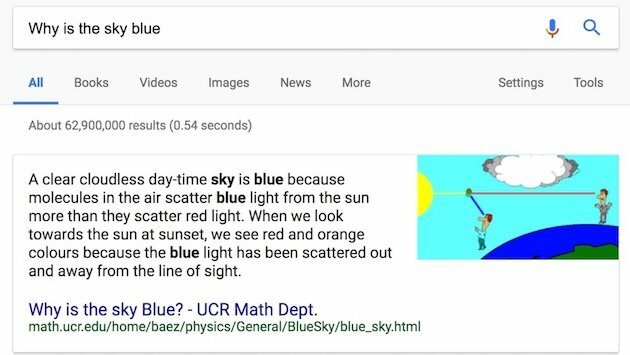 To stave us over until that time, I dug in and examined what we can learn about this new search engine results feature, and what it might mean for your content strategy. What actually shows up for these "in-depth article" results? What is clear is that currently, these new results seem to favor "big brands." 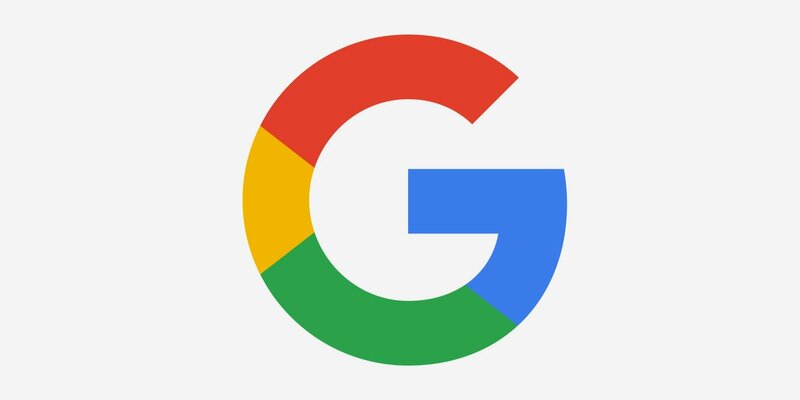 Meaning, well-known publishers are being favored, though Google does promise that "you'll also find some great articles from lesser-known publications and blogs." So stay tuned. Obviously their primary measure of "quality" right now (as far as these types of results are concerned) is based on reputation, hence the big brand names. What does this mean for you? Quality content that is well-researched, thorough, and original is a must have. The idea is for your content to be non-commercial, which means not focused on "selling" your business, products, or services. To show up in these results, your content should reportedly be about 2000-5000 words -- not all of it, but about 10% of your content should -- and it should be thoughtful and well-written so that it remains relevant for months even years to come. These results, for instance, provide high-quality content to help you learn about or explore a subject. Also, they are free resources -- content that is not gated in anyway. What else do these results have in common? Rank: Content that didn't previously rank now ranks on page one. Interestingly, the 3 "in-depth" results are counted as part of the 10 results on the page, even if they only appear at the bottom of the first page of results. 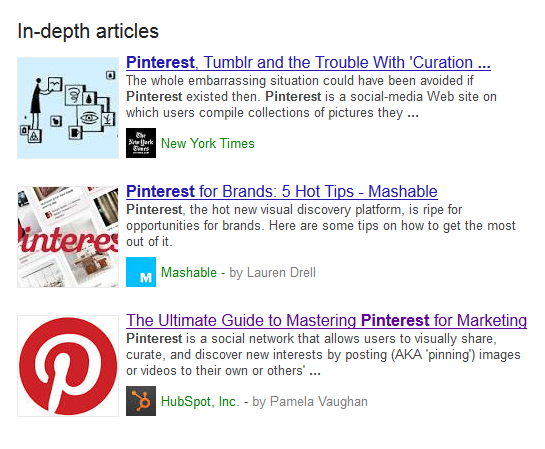 For example, if you perform a search for Pinterest you'll see 10 results on page one, including the in-depth articles. Markup: One of the ways that Google gets more of your content is based on what your code/meta data says, or markup language (which I'll refer to as just markup). There is basic markup like a headline, alternativeHeadline, image, description, datePublished, articleBody, pagination, canonicalization, logo and authorship -- all of which Google recommends to help your content appear for in-depth articles. However, notice how the New York Times article does not list an author. As such, it appears that you don't really have to have all of these elements. It's also suggests that your business or brand should have a Google+ account -- and that's not the case here, either. So, what do I absolutely need to have? Relevant Content: One thing that all these results have in common is topical (or keyword) relevance. Duh, you may reply. But that's not so easily done when you're harping on a magical keyword density. Instead, you want to write to make sure you cover every nick and cranny of a story/topic. Images: Every article has one (at least) primary image that is crawlable and indexable. It's that image snippet that appears alongside the article in the search results. 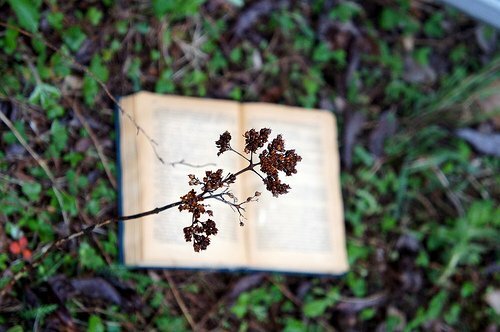 A Different Take on Things: In addition to being very thorough, all of these articles take a different spin on things. Again, Google is surfacing content that is original, probably has already performed well, and adds depth to a search. In short, investing in thorough content does pay off. For example, we've seen a huge increase in exposure for a term that we didn't even rank for before Google's release, and have gotten some new business from it, as well. However, it's still early in the game. But if nothing els,e you can expect a huge amount of brand exposure from working toward getting some articles ranked in this new section of Google's search results. Have you notices a huge boost in traffic for certain terms? Have you looked in whether any of your content is ranking as an "in-depth" article, perhaps?